The times they are a changing. The traditional fiberglass deep V Cuddy Cabin style of fishing boat that once dominated on the Great Lakes severed a lot of captains well, but this style of boat and charter trip may have run its course. Larger “charter style” boats provide a lot of space and creature comforts, but these boats must also be slipped in a particular port. The owner and/or charter client is saddled with the necessity of fishing only one port all season long. The Great Lakes recreational fishing resources are in turmoil. No one knows what the future holds for anglers who target species including lake trout, king salmon, coho salmon, Atlantic salmon, steelhead and brown trout. The uncertainty of the Great Lakes fishery has some savvy anglers opting for smaller boats they can trailer to hot ports at peak times of year. Success on the water boils down to the ability to be mobile and to key in on critical fisheries at the most optimum times of year. A new breed of welded “V” hull boats are helping anglers enjoy the freedom of mobility on and off the water. 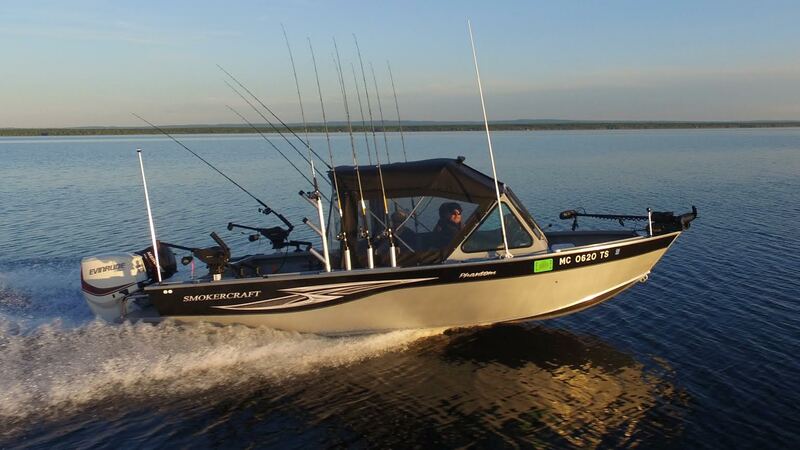 The new Smoker Craft American Angler Phantom series are a good example of boats made for big water and made to take on the toughest conditions. These welded Deep V hulls are fabricated from .190 thick aluminum on the running surface and .125 thick aluminum on the side and top decks. To say these boats are built tough is an understatement. These boats are built to last a lifetime and to challenge the unpredictable waters of the Great Lakes. The Phantom series features four models including the 222 Offshore, 202 Offshore, 202 and 182. The console forward design of the Phantom series makes for a boat this is ideal for trolling chores. These boats also offer a generous amount of canvas to keep the elements at bay and insure everyone arrives at the fishing hole dry and ready to fish. Built tough, designed to be mobile and a functional trolling platform, the Phantom series of welded hulls from American Angler and Smoker Craft are worth taking a closer look at. For more information check out www.americananglerboats.com.